Definition: Accounting is a process, which systematically and comprehensively records business events and transactions, and translate it into the financial information of the business entity to assist the stakeholders in the decision-making process. In this process, the transactions are identified, recorded, arranged, summarized, simplified properly and then communicated to the interested parties. Generally Accepted Accounting Principles (GAAP) provide the rules for the preparation of the accounting statements, in the form of concepts, conventions, assumptions and principles. It not only removes confusion but also provide consistency and uniformity in the process. These are the fundamental assumptions, on which the entire system of accounting is based. 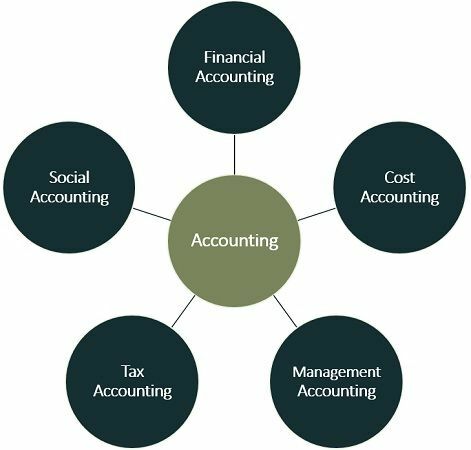 Financial Accounting: It is that branch of accounting, which involves the recording of the transactions, inclined towards the preparation of trial balance and final accounts. Cost Accounting: Cost account is the accounting discipline, which deals with costs, i.e. the unit costs of the goods produced and services provided. It helps the management of the organization in fixing the price, controlling costs and providing relevant information for the purpose of decision making. Management Accounting: The accounting system which supplies the necessary information to the management, for rational decision making. The information may be concerned with funds, costs, profits and losses and so forth. This information is helpful in determining the effect of the decisions and analysing the performance of the entity. Tax Accounting: The accounting system that deals with the tax return and its payment, instead of preparation of final accounts of the enterprise, is called tax accounting. Social Accounting: This branch of accounting is commonly termed as social responsibility accounting. It aims at unveiling the facilities provided by the entity to the society, in terms of medical, housing, education, and so forth. These accounting branches have been developed as a result of rapid economic development and technological improvements, that increased the company’s scale of operations. Due to this very reason, the management functions has become complicated and resulted in the development of branches. Systematic record keeping: The first and foremost function of accounting is the systematic record keeping of the financial transactions, on a regular basis. Facilitating rational decision making: Another important function of accounting is to communicate the results, i.e. the net profit or loss to the users, with the help of financial statements, so as to help the interested parties in rational decision making. Legal compliance: The accounting statements must be prepared keeping in mind the compliance with the relevant laws. Protection of business assets: Accounting not only keeps a record of all the business assets but also ensures no unauthorized use of assets or property belonging to the enterprise. Determination of Profit/loss: Accounting plays a very important role in the ascertainment of profit earned or loss sustained by the enterprise in an accounting period. This is possible only when a proper record of all the business transactions, revenues and expenses are maintained. Ascertaining the profitability, liquidity and solvency of the entity: With the help of the financial statement, i.e. Balance sheet and profit and loss account, the financial position of the enterprise can easily be ascertained. The fundamental objective of accounting is to keep complete records of the business transactions, so as to determine the financial performance and position of the enterprise and convey the information to the user groups such as shareholders, employees, creditors, suppliers, government and other groups.